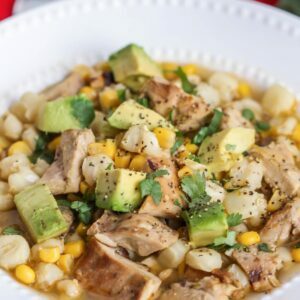 Delicious Chili Verde Soup (AKA Green Chili Soup) Filled With Chicken, Corn, Avocado, Cheese And More! It's Perfect All Year Round And Is Always A Crowd Pleaser. Heat oil in skillet over medium-high heat. Add marinaded chicken to hot oil. Season both sides with cumin, chili powder and salt and pepper. Sear for 4-5 minute. Repeat to both sides of the chicken until cooked through. Set aside and let cool for about 5 minutes, then cube.. In a large pot, heat up your salsa verde. Add chicken stock and bring to a simmer. Add your corn, hominy and chicken. Let simmer 5-10 minutes. Add the cilantro and scallions. Simmer another two minutes. Just before serving, garnish soup with avocado, cheese, a dollop of sour cream, and more cilantro.